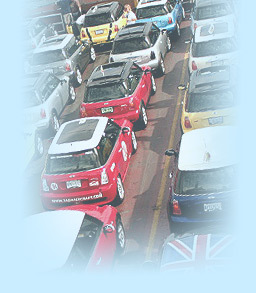 1 - Arrive at the Howard Johnsons (HoJos), downtown waterfront Kingston by 11:00 am for check-in. Refer to the hotel web site and this location map and driving directions. 2 - Travel aboard the "Wolfe Islander" car ferry to the Island. Up to 60 MINIs on the ferry at one time! 3 - The Wolfe Island Adventure Rally Scavenger Hunt, across the Island, including a Rally Box Lunch Picnic. 4 - Return by ferry to Kingston. 5 - Shine 'n Show: Reserved MINI Parking Only at Kingston City Hall, downtown on the waterfront. 6 - Explore unique downtown Kingston's many shops and cafes. 7 - Patio barbecue at the HoJo. MINI guests only. 8 - Kingston Haunted Walk or Comedy Club. 9 - Secure underground overnight parking at the hotel. MINI ONLY Track Experience Day! 1 - Breakfast at the Hotel. 2 - "MINI ONLY" Track Experience Day at Shannonville Motorsport Park, all day from 9:00 am until 5:00 pm (Fabi Circuit: 2.23 km). 3 - The track will be limited to 12 MINIs at a time. Really experience your MINI! MOTOR with similarly experienced drivers on the track. You will SMILE a lot! 4 - Depart for home, or optional night at HoJo's in Kingston.